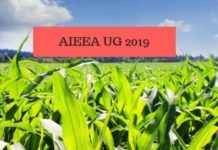 AIEEA UG will have questions from subjects such as Physics, Chemistry, Mathematics, Biology, and Agriculture. It is a national level entrance exam in which questions are based on official ICAR exam syllabus. First of all, take a look at following important ICAR exam date. ICAR conducts three exams: AIEEA UG, AIEEA PG, AICE JRF SRF PGS. Here we are talking about the UG entrance exams; for other. Qualifying exam: You should have passed (or appearing) 10+2 exam from a recognized board. Your aggregate score should be at least 50% (if you are belonging to general / OBC NCL / UPS category) or 40% (if you are belonging to SC / ST / PC category). Age and nationality: You should be an Indian national. Your age should be at least 16 years. Online forms is issued by ICAR. the application process was over on the official site of ICAR. It is advised that the candidates should fill in all the details in the application form very carefully. Any incorrect or invalid information may lead to rejection of the application forms. Also, the candidates might have to upload a photograph which should be recent passport size colored, thumb impression (left for male/right for female) and signature. Candidates are advised that they should take the print out of the confirmation page of the application form. The application fees for various categories of students vary accordingly and the candidates have to pay the fee by the means of Net Banking. The exam syllabus is always given in official information brochure.It is better to study all topics given in the syllabus to improve chances of scoring well. ICAR exam syllabus contains: physics (20 units), chemistry (35 units), biology (9 units), mathematics (10 units), agriculture (4 units). Depending upon which courses you plan to study after 12th class, you will appear in PCM/PCB/PCA/ABC subjects. 2 ½ hours is the duration of the exam. The language of the question paper will be Bilingual i.e. English and Hindi. Five subjects including Physics, Chemistry, Mathematics, Biology and Agriculture will be contained in the single question paper booklet. Out of these 5 subjects, the candidate has to choose only three subjects. 60 multiple choice questions will be asked for each subject and there will be four options for each question. The aspirants have to attempt only 180 questions as per subject combination selected. Maximum marks of the test will be 720 marks. 4 marks will be awarded for each correct response. If a question is not attempted then the aspirant will get no marks for that particular question & no marks will be deducted as well. If the candidate marks more than one answer for a single response then such response will be deemed as incorrect answer and will invite negative marking. Category-wise final merit list is also be prepared after the declaration of the result. Students selected in this merit list will be called for AIEEA counselling. The list shall contain details of the candidate and the date when they need to appear for the counselling. The applicants will also have to fill the counseling form and they need to produce a copy of their Counselling intimation letter. Also, the fees for counseling and the rest of the documents as mentioned below are also important for the counseling purpose. SC, ST and non-creamy layer of OBC categories have to provide original Certificate as per Central Govt. requirements and issued by Competent Authority. In case of Physically Challenged (PC) candidates have to provide a medical certificate issued by Medical Officer of any Government Hospital with description of the kind and the degree of disability. Birth Certificate, in case if Date of Birth is not mentioned in the Class 10th certificate. Authority letter/undertaking if the candidate is unable to attend the counseling personally. On the basis of the published overall merit-rank, the candidate will be allowed to take admission in a specific degree programme at an Agricultural University as per his/her choice and availability of seat at that merit-rank. The admission will be through a process of online counseling. After the admission in allotted university or after counseling, change in the subject/university or transfer/migration would not be entertained under any circumstances. Any request for this may even lead to cancellation of admission of such student. 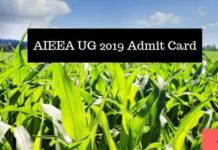 Aspirants selected for admission through AIEEA, conducted by ICAR, may seek admission only during the session for which the Examination has been conducted. Female candidates admitted through this examination on ICAR seats should be accommodated, to the extent possible, in the main campus of the University or in the campus located in a major city where there are adequate facilities for the stay of female students. In case, at any stage of the admission process, it is found that the documents submitted by the candidate are fake/ forged, admission of such candidate will be forfeited and he/she shall be liable for consequential legal action. For 2018 ICAR examination i have applied from Kerala , giving 3 center options from Kerala. when hall ticket is released they have allocated examination center in Vijayawada ( Andrapradesh ) . In the application form they have mentioned in clause -11, if the candidates are more they will allocate center to the adjacent center. How come Andrapradesh is becoming adjacent Kerala state. If they are allocating on first come first serve basis i have have applied on the same day on calling for applications. iam from kerala and i got my ICAR exam centre at madhya pradesh.i didn’t prefer madya pradesh for my exam centre since its too far from kerala.i got my admit card this morning.it’s too difficult to reach madhya pradesh within 5 days without any planning.some of my friends also got centre too far from kerala.i don’t know what to do now. My choice of centre was Kolkata ,Howrah,Durgapur . But my admit card shows my centre is Varanasi (041). Sir how it is possible from West Bengal to attend exam at Varanasi in short prrper? Could you pl.do the needful to change my centre any where at West Bengal? Thank you. Due to some circumstances the admission was been cancel and put on hold, but don’t worry the process will be made running soon. My son also got centre in Andrapradesh. How much we struggled and went to there from Kerala and attended exam. Finally they cancelled exam. Isn’t justified? Don’t play with children life…He is toomuch upset ….Who is responsible for that…..
sir i’m from karnataka i lost all other seats of so many courses im totally depended on it sir please dont play with us give the date of re exams ……….. 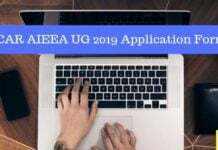 I applied for AIEEA-UG-2018 (Roll No 335020156; Application No. 1011680) and my 1st choice of Examination Centre was Guwahati, Assam. The Second and third were Shillong and Kolkata respectively. However, in the Admit card it appeared that the Examination centre was 3502-sagar institute of Research and technology—— Bhopal (Exam city 039-Bhopal). I wrote a letter through the mail given in the website but no reply received. Now, since the Exam has cancelled, this time, I may kindly be permitted to sit in the Examination at any of the Centres at Guwahati, Assam. Looking forward for your kind consideration. This is unfortunately not in our hands, please contact the officials for the same. Am I in need of sending the online payment receipt with the printout of application form in registered post? Sir having compartment In additional subject will give icar? Sir,it is not possible for kerala students to attend the exam. It is flooding in kerala.Will the exam centre and date be changed? Sai I am from kerala . Here impossible to write exam due to heavy flood and rain.